Most Atlanta Braves fans have taken in games at both Turner Field and SunTrust Park, have fond memories of the team's pitching dominance in the '90s, and proudly watched Chipper Jones get inducted into the Hall of Fame. But only real fans have traveled to Florida to watch the Fir... read full description below. Most Atlanta Braves fans have taken in games at both Turner Field and SunTrust Park, have fond memories of the team's pitching dominance in the '90s, and proudly watched Chipper Jones get inducted into the Hall of Fame. But only real fans have traveled to Florida to watch the Fire Frogs, can recall all 14 of the franchise s no-hitters, and can tell you the only man to play for the Boston, Milwaukee, and Atlanta Braves. 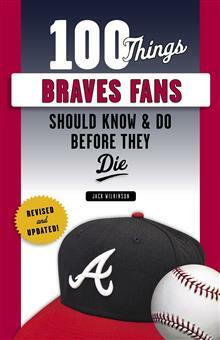 100 Things Braves Fans Should Know &amp; Do Before They Die is the ultimate resource guide for true fans of the Atlanta Braves. Whether you're a die-hard booster from the days of Hank Aaron or a recent supporter of Freddie Freeman and Dansby Swanson, these are the 100 things all fans need to know and do in their lifetime. Veteran sportswriter Jack Wilkinson has collected every essential piece of Braves knowledge and trivia, as well as must-do activities, and rank them all from 1 to 100, providing an entertaining and easy-to-follow checklist as you progress on your way to fan superstardom. Jack Wilkinson is a retired journalist who covered sports for more than 30 years with the Atlanta Journal-Constitution and other newspapers around the country. A three-time Georgia Sportswriter of the Year, he has written several other books, including Of Mikes and Men: A Lifetime of Braves Baseball, co-authored with Pete Van Wieren.